“DONE IS BETTER THAN PERFECT” IS THIS A TRUE STATEMENT? 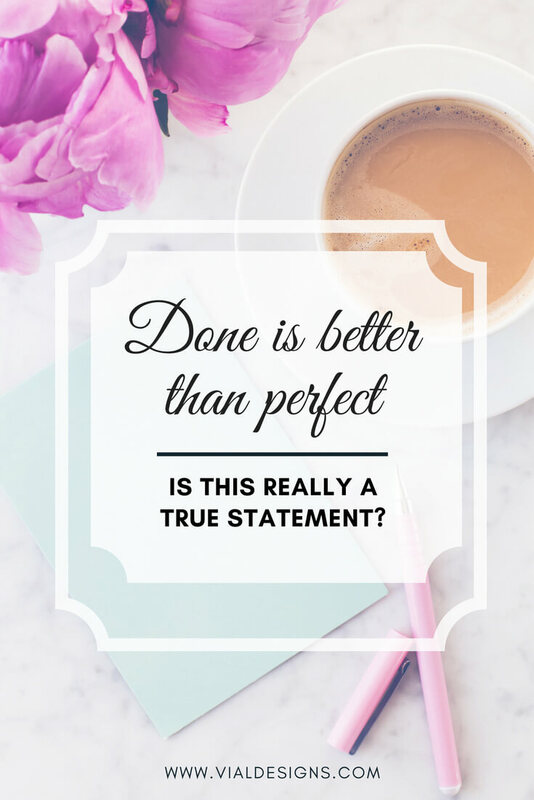 Done is better than perfect – is this a true statement? I’ve asked myself this question for a long time. And I have to say; I’ve struggled with this sentiment A LOT. I didn’t know if I should love it or hate it for what it represents. The truth is, I didn’t agree with this quote for a LONG time. The reason why I struggle with it is that I’ve always considered myself to be a perfectionist. I always thought things needed to be perfect or else they weren’t worthy. You see, for me, if I didn’t strive for things to be perfect, then I was denying the true potential behind my work. The problem with being a perfectionist is that I can get easily discouraged. This, in turn, means that is hard for me to follow through with something because is “not perfect”. Perfectionism often comes with doses of procrastination. I lost count of all the projects that I have yet to finish because they are not perfect. Because I need to know everything so I can make them perfect. Side note: I used an Uni-Ball UM 153 Signo Broad Point Gel Pen on craft paper to create this sign. 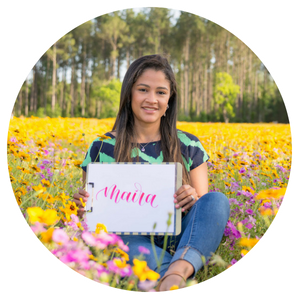 If you’d like to get started with learning hand lettering, then you’ll enjoy this blog post. The truth is, action beats intention every single time. It doesn’t matter what you say you’re going to do, it matters if you actually do it. I’ve come to the realization, that in order for me to discover if something is perfect or not, I have to act on it. We are imperfect humans and as such, we will produce imperfect work. I mean, only God is perfect. “Perfect” is a matter of perspective. Something might be perfect for me, but will not be perfect for others. And that’s ok.
Fun fact… Did you know that the word “perfection” comes from the Latin “perficere,” which means “to complete”? Perfection means to complete, to finish. So in that sense, done is equal to perfect! I had no idea of this and thought it was something cool to share. 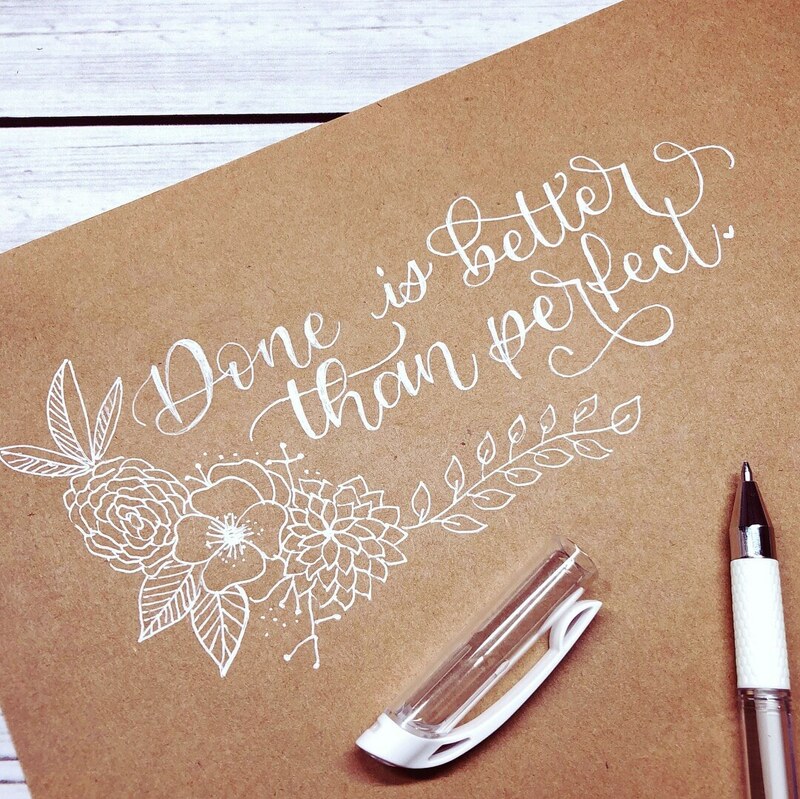 Done is better than perfect doesn’t mean that you can do a crappy job. It means that you have to strive for the highest quality of your work, but you actually have to finish it. The key to moving ahead is getting started and following through. So I’m learning to follow through and aim to finish what I start. I have to say I’m now a “recovering perfectionist”. Are you a perfectionist or a doer? do you agree with this quote? I’d love to hear your thoughts on it.